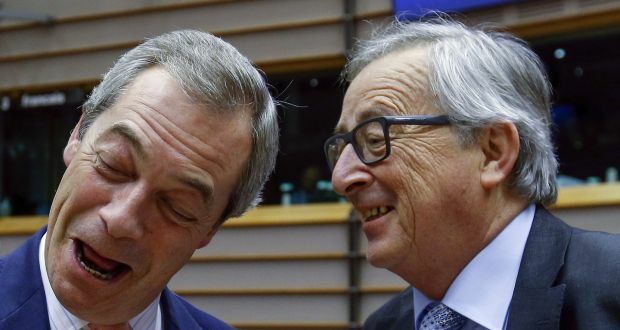 Nigel Farage (left), Britain’s UK Independence Party (UKIP) leader and European Commission President Jean Claude Juncker (right) take part in a plenary session at the European Parliament on the outcome of the “Brexit” summit, in Brussels last month. Global business growth slowed last month as services from Asia to Europe reported waning demand and little or no inflationary pressure, suggesting more central bank stimulus may be needed, surveys showed. Euro zone businesses had their worst month in over a year. British services companies endured their worst month in nearly three years. US services are likely to report a deceleration later. Thursday’s downbeat surveys come just days after sister reports showed manufacturing output across much of Asia shrank in February. Another cut in the already-negative deposit rate is likely when the ECB meets on March 10th . On Monday, China’s central bank announced it was cutting the amount of cash banks must hold as reserves for the fifth time since February 2015. Some analysts expect it will have to do more, including cutting interest rates this year. The Bank of England was once expected to be the first major central bank to tighten policy. Now it is not expected to act until the end of the year, and Thursday’s readings may push the forecasts even further out. The US Federal Reserve was the first big bank to move, raising rates in December. But it is assessing how much slowing global growth, tightening financial conditions and lower inflation expectations will affect the US economy, and it is unlikely to raise them again this month. The final Markit Composite Purchasing Managers’ Index for the euro zone, seen as a good guide to growth, slipped to 53.0 last month from January’s 53.6, its lowest reading since the start of 2015. That was above a preliminary reading of 52.7 and still over the 50 mark that denotes growth. But inflation fell to -0.2 per cent last month, nowhere near the ECB’s target of just below 2 percent, and Markit’s survey showed companies cut prices at the steepest rate for a year. In Britain, the Markit/CIPS services PMI slid to 52.7 from 55.6, the weakest reading since March 2013 and worse than all the forecasts in a Reuters poll of economists, which produced a median forecast of 55.1. It was the first time Markit had cited as a factor in business expectations a June 23 referendum on whether Britain should quite the European Union. That prospect may be one reason BoE policymakers say they will boost the economy if necessary. “Should it vote to leave, then the near-term growth backdrop will deteriorate even further, which will likely result in renewed Bank of England policy stimulus,” said James Knightley at ING. News from Asia was no better. Growth in India’s services industry slowed and reached a seven-month low in Japan. Activity contracted in Hong Kong for a 12th month. Meanwhile, Chinese results suggest a prolonged slowdown in the world’s second-largest economy and in its manufacturing is starting to drag on services. Their activity slowed, adding to risks for policymakers, who are counting on robust services growth to offset a planned overhaul of bloated state companies. He Fan, chief economist at Caixin Insight Group, said further government measures were need to boost services and improve balance in the economy. “While implementing measures to stabilise economic growth, the government needs to push forward reform on the supply side in the services sector to release its potential,” he said.